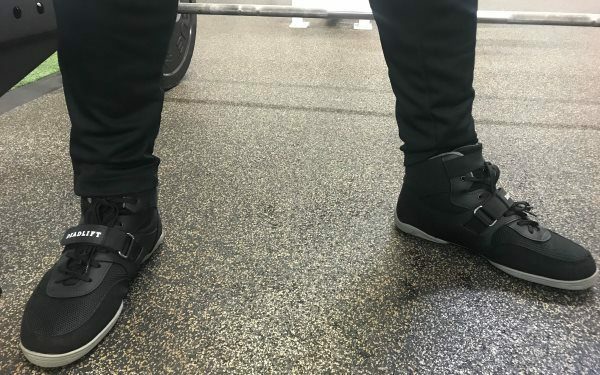 Home > Blog > Reviews > SABO Deadlift Shoes Review: Are These the Best Shoes for Deadlifts? I am writing this SABO Deadlift Shoes review after a full 6 months of thorough testing. During this time, I wore the SABO Deadlift Shoes for 2 of my usual 3 workout sessions per week. Each session lasted 2-3 hours for all exercises. I deadlifted during one of these two sessions. My deadlifting typically consisted of 3 warmup/ramp up sets and 4-5 working sets ranging from 1-4 reps per set. I’ve put my SABO Deadlift Shoes through more than enough stress to give a fair assessment. All in all, I’ve worn them for 100+ hours of training, including both deadlift-specific and general weight training conditions. Lastly, I am a conventional deadlifter. However, I learned how to do sumo deadlifts and included a fair amount of it in my training so I could test how the shoes performed for this review. I included sumo pulls as warm ups and/or back off sets to my primary conventional work, and sometimes I'd do dedicated sumo sessions. Before buying these, I was a bit weary about the construction quality being subpar after reading reviews from others. Luckily, as I eventually found out, those reviews were all done by people who had the previous version of the SABOs. The version I got was the “2017 SABO Deadlift Shoes” (aka the "SABO Deadlift-1"), which had only been available from MaxBarbell for a few months when I purchased them. The sole thickness on the SABO Deadlift shoes is absolutely perfect. It’s a mere 5 millimeters thick. That’s very thin (but not too thin)! Thin soles are probably the #1 feature you want a deadlifting shoe to have. The thinner the sole, the closer you’ll be to the floor when deadlifting. 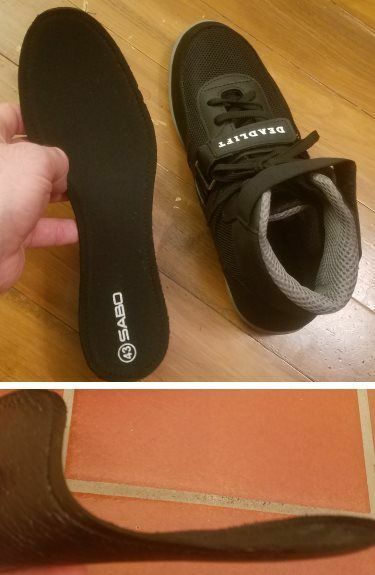 It reduces your range of motion compared to shoes with thicker soles. Even a few millimeters can make a slight but real difference in your max deadlift compared to thicker-soled shoes. That’s why you’ll see powerlifters competing in thin-soled shoes. Every pound counts. 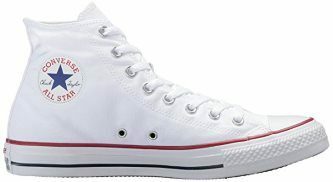 For reference of how thin 5 mm is, Chuck Taylor high tops have soles around 10 mm. They’re considered thin-soled as far as regular sneakers. So the SABOs half as thick! Reebok Nano’s, which are made for CrossFit or general weight training, are about 15 mm. That’s still not considered a thick sole compared to most shoes. Still, it’s a full 3x the thicknes of the SABOs. Regular sneakers or basketball shoes are when you get fully into the thick sole territory. They’re usually around 20-25 mm thick, or 4-5x thicker than the SABO Deadlift Shoes. Foot protection: 5 mm is thick enough to provide a bit of support and enough material protect the bottom of your foot when walking around. I also have deadlift slippers which are about 2-3 mm thick. They’re great, but only for deadlifts. You feel every crack you step on, and you have practically no support at all walking around. If you do calf raises or any other lift where your foot presses against a hard edge, it will hurt. Durability: The thinner your sole is, the faster it will wear out. 5 mm soles will still eventually wear thinner and break down given enough use. However, it will take a while. If I wore my 2-3 mm deadlift slippers as much as I wear my SABO shoes, they’d probably be very close to the end of their life cycle. They might not be worn all the way through yet, but the surface would probably be flat and untexturized. Grip: When you have 5 mm soles, that’s just enough for some nice grooves and patterns to be cut relatively deeply into them. These textures contribute greatly to how well your shoes grip on the floor. And since they can be cut a ways into the sole, they’ll still be there for a while even as the sole slowly wears down over time. Not only are the soles super thin, but they're also super flat as well. You can determine precisely how flat or how angled a shoe is by looking at it's "heel to toe drop," or how much higher the sole is in the heel than in the toe of the shoe. It puts your ankle joint at the best angle (i.e. between your foot and shin) for facilitating mechanically advantageous positions in the rest of your body (i.e. knee & hip angles, back position) in terms of optimal leverages for deadlifting. It ensures that you're no higher off the floor than absolutely necessary. 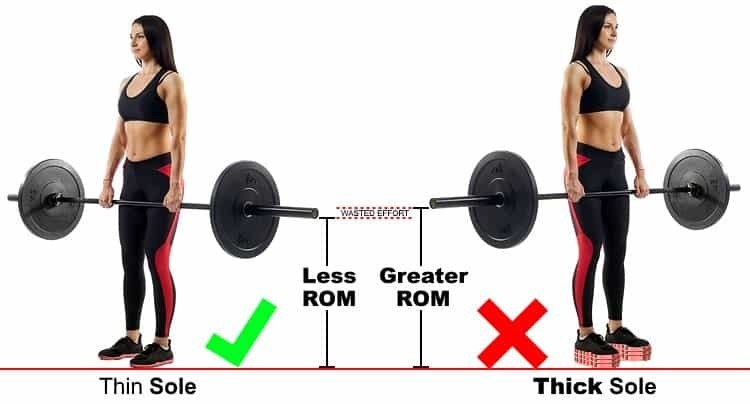 This goes back to minimizing deadlift ROM as discussed in the previous section. Now, there are a handful of deadlifters that can perform conventional deadlifts (NOT sumo) better in raised heel shoes, like Garrett from Massthetics. However, this is quite uncommon as it's usually lifters with uncommon limb/torso lengths and proportions who find it effective. For this small segment of the lifting population, Olympic lifting shoes are a better footwear choice. For the rest of lifters, flat shoes like the SABOs are superior deadlifting shoes. The SABO shoes have soles made from rubber, which is the ideal material for grip. On top of that, they have a unique textured patterns on the bottom specifically designed to enhance grip against the floor when deadlifting. 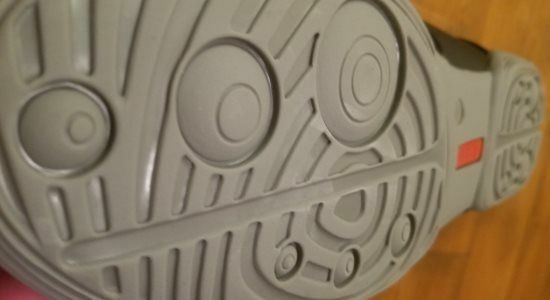 This pattern includes relatively wide grooves that form concentric circle-like shapes on the upper (ball of the foot region) and lower (heel) portions of the sole. Then there are several deeper cut “traction pods” of various sizes placed in the specific points on the sole where your foot will typically extert the most amount of force. Thus, you have multiple lines of defense against slipping. Your feet will remain anchored even during the heaviest of pulls where you’re exerting tons of rotational and outward pressure from your hips/legs into the shoes. In terms of longevity, the grip patterns have held up better than expected considering their minimal 5 mm thickness. I’ve noticed no difference in the “feel” of their grippiness when I’m deadlifting. As you can see from the photo below, the wear of the patterns is mild. The amount of wear is noticeable, but not severe. There's still enough grip left for at least another year of hard training. As I mentioned in the beginning of this SABO Deadlift Shoe, I’ve worn these shoes for about 6 months during two, 2-3 hour sessions per week. There are plenty of shoes out there that are completely adequate for deadlifting. Some have ankle straps for bolstering ankle support. Some have metatarsal straps for increasing midfoot support. Others have no straps whatsoever, relying on the shoe’s upper and tight lacing for support. The SABO Deadlift Shoes are the only pair on the market as of yet that have BOTH an ankle strap AND a metatarsal strap. This unique combo is a big selling point for me. It ensures that these key regions of the ankle and foot will have all the support they need when pulling heavy weights. In the following sections, I’ll talk about the importance of ankle and metatarsal support in deadlifting, and specifically how the construction of the SABO shoes help achieve it. High top design: The shoe collar extends up high, completly covering the ankle joint. Having a high top design is foundational to having good ankles support. It’s a prerequisite. The high top wraps around your ankle, creating a physical support structure in all directions. It restrains excessive and unexpected movement at the ankle joint, thus making it more stable especially under load. You can tie your laces looser or tighter to reduce or increase the amount of ankle support from the high top structure. 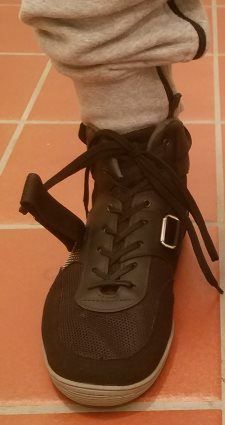 Ankle strap: In addition to the high top design, the SABO Deadlift Shoes also have an ankle strap at the top of the collar. It secures from one side of the shoe to the other, crossing over the tongue. The strap has an elastic porition, allowing you to stretch it a lot or just a little bit, for more or less tightness. It should be noted that the ankle strap provides more subtle support compared to the metatarsal strap. For example, if you crank the metatarsal strap to it’s max capacity, it’ll be tight to the point of discomfort. However, it you attach the ankle strap as far as it allows, it will just be a bit more snug. 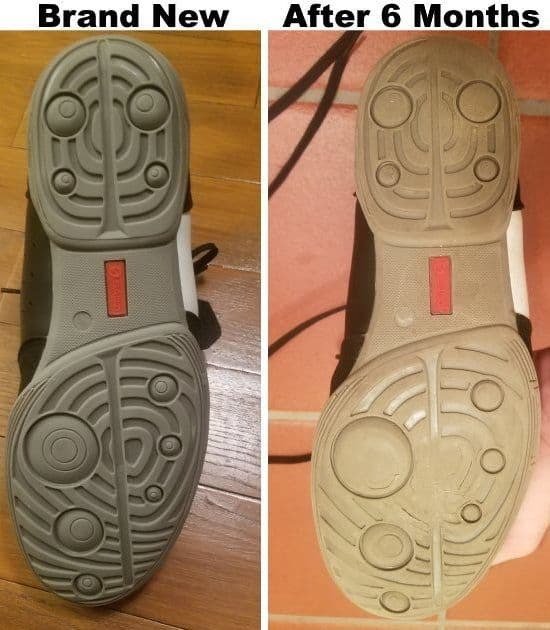 It’s noticeable, and does make an importance difference, but it won’t make up for if you haven’t laced your shoes tight enough. So, be sure to tie your shoes with adequate tightness first, then adjust the ankle strap tighter or looser as needed for your optimal amount of support. Most alternative shoes have just the high top design, without the additional ankle collar. The few competing shoes that do have the high top + ankle strap combo do not have the metatarsal strap. A standout feature of the SABO Deadlift Shoes is their excellent metatarsal, or midfoot, support. You’ll know you’ve achieved ideal midfoot support if your shoes have a very firm (not overly tight) and evenly distributed, almost glove-like fit around your midfoot region. Why is good midfoot support so important? It goes a long way in making your feet stable. You’re feet are firmly enveloped so your feet won’t be able to do any slight shifting or sliding around inside like they would in less supportive shoes. It also greatly reduces wobbling, since your foot muscles don’t have to struggle so hard to maintain stability. Finally, it can help keep you in a more neutral foot posture, and avoid or at least reduce any tendancy towards foot pronation. Excessive pronation is a very common dysfunctional movement pattern. If you’re prone to it (no pun intended) , it will become very obvious during deadlifts or squats, especially as the loads become heavier. Sufficient midfoot support helps, but it won’t eliminate it if it’s a problem for you. For that, you need to both strengthen and improve the motor control of the muscles that support a strong natural foot arch and properly aligned ankle and foot joints. That’s different topic altogher, but a good place to start is single leg exercises. All in all, good metarsal support makes you feel physically much more rooted on the floor. You’ll have a much better feel for exactly which point in your feet to direct force into the floor. Not only that, but you’ll be better able to direct force through that point consistently for the duration the lift, as opposed to shifting that point around from lack of stability. Moreover, you’ll be able to drive force more efficiently into the floor, which translates translates to being able to lift heavier weights. All of these things are very beneficial on deadlifts, conventional and sumo. They’re arguably even more beneficial on squats. This is one of the reasons why these shoes are also great for any squatter who prefers flat-heeled shoes over raised-heel shoes. So what exactly produce the superior metatarsal support in the SABO Deadlift Shoes? It’s a few things. Shape and “formability”: It closely matches the general shape of a foot. The upper is made from materials that are flexible enough to form to the shape of your individual foot countours (yet still firm enough to provide support in key areas). Basically, it’s as close to fitting like a sock as a you can get with an athletic/lifting shoe. 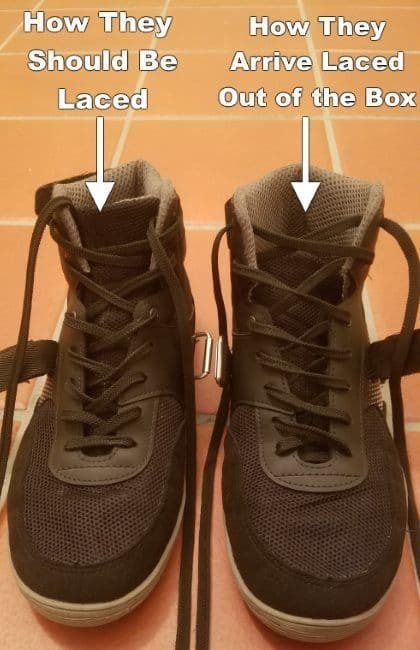 Minimal Gap Between Laces: As you can see in the image below, the gap between the left and right side of the laces area is very narrow compared to most other shoes. This allows you to get a tighter fit when tying your shoes. Plus, it makes the shoes fit more firmly around this top portion of your foot since the structure of the shoe’s upper is more continuous. This comparatively continuous structure also means the that the metatarsal support created by the laces is more evenly distributed than if there were a larger gap. A Metatarsal Strap: The SABO Deadlift Shoes get their impressive metatarsal support thanks to their well-placed and well-constructed metatarsal strap. It is not just a strap the goes from one side to other. Rather, it loops through a buckle, making it a cinch strap, which is cable of much stronger forces. This ensures a deeply rooted attachment that can easily endure lots of torque over a long time. The loop portion: This is the soft, fuzzy part. It makes up the first ⅔ of the length of the strap. It’s opposite the twill-woven fabric portion. The hook portion: This is the hard, scratchy part. It makes up the final ⅓ of the length of the strap. It’s opposite the thick end portion that says “DEADLIFT” on it. When the strap is secured, this hook portion will be on top of the loop portion. 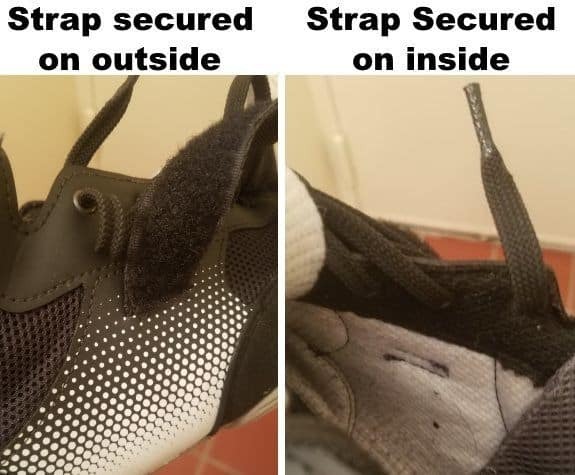 There is a metal buckle securely attached to the the inside of each shoe’s upper. 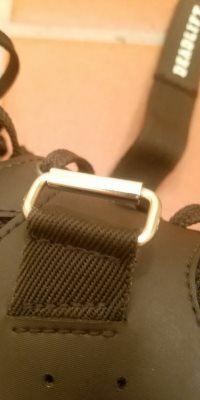 You put strap through this buckle pull as tightly as desired, and fold it back down onto itself. As far as I can tell, the velcro works just as good now as it did when I first got the shoes. I want to make it clear that the entire strap/buckle mechanism is very strong and durable. You can crank it down super tight. Like to the point of discomfort, if your shoes are also laced firmly. It can easily hold it’s position in the short term. And there’s no signs of wear in the long term. The sole or the upper will wear out long before this part. The difference between how much you can tighten the metatarsal strap vs. the ankle strap is night and day. Of course, you wouldn’t want to be able to tighten the ankle strap anywhere near as tight, since your feet might fall asleep from reduced circulation! I mention the difference only for comparison’s sake. 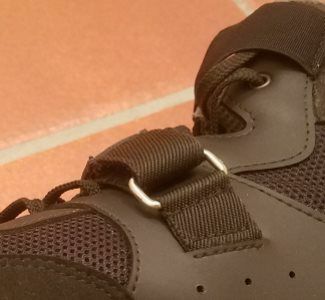 In addition to providing metatarsal support, the metatarsal strap indirectly contributes to “side support” because it makes the sides of the shoes more taut when the strap is tightly secured. I’ll discuss side support in detail in the following section. There is only one (slight) negative about the strap construction that I’ll discuss in more detail in the “cons” section. Here’s the basics, though: I had had random loose threads around the straps. However, there was no progressive deterioration and no negative impact functionality. I fixed the sloppy aesthetic by trimming the threads. Still, a better sewing job would’ve prevented it. The inside and outside of the “upper” were constructed with wide sections of a much sturdier and more resistant material than the rest of the shoe. These sections of material are there specifically to reinforce the sides of the shoes, particularly to resist the force of your foot rotating or pushing outward. The sections are a few inches wide and located on either side around the midfoot region, which is where the most of the force is directed through when pushing out lateral. The material extends up from the sole of the shoe at the arch. From there, it goes all the way up to the laces, and then actually wraps around the entire laces section. So the material really wraps goes from one side of the shoe to the other, creating greater and more broadly distributed side support. This is exactly what you want when doing sumo deadlifts (or wide stance squats). The wide foot stance necessarily require pushing outward through your feet as you pull the weight up. Trust me, your feet will be rock solid when pushing up against the sides of these shoes during sumo pulls. While rolling your ankle during sumo deadlifts is very rare, these shoes will absolutely prevent that. A more practical benefit is that you spend less energy and focus on maintaining ankle position. On top of that, the mechanics become slightly more advantageous: You have what is essentially an immovable side wall around your foot that you can push off of; thus, you can driving more force into the floor and pull more total weight than you could otherwise. The SABO Deadlift Shoe has a very similar design to many wrestling shoes. Just compare it to the ASICS Matflex wrestling shoe and you’ll see the general shape of the shoe is similar. This is by design, as it gives you a wider and therefore more stable and rooted surface from which to pull. 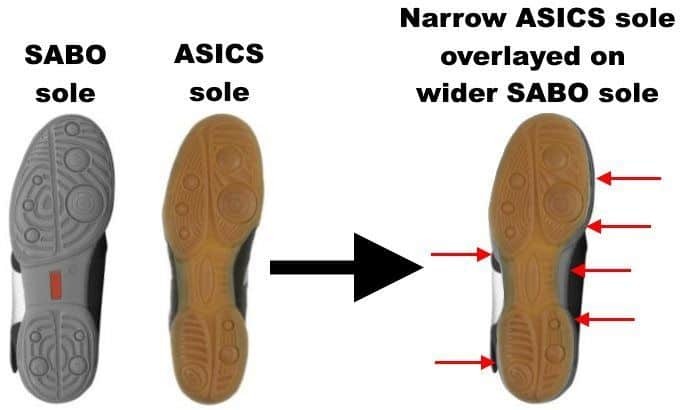 The overall size of the SABO sole is larger in general, but they also have small “flanges” on the sides which help to expand the surface area of the outsole in key areas. This wider footprint gives you a more stable base to stand on when deadlifting. You can see in the image below how the flanges curl up onto the upper of the shoe. This serves to further enhance the SABOs side support. 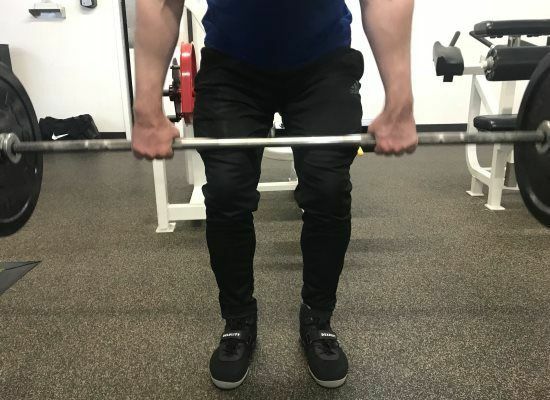 It’s another physical barrier preventing your foot from sliding over the edge of the insole, when you’re “spreading the floor” with sumo deadlifts or wide stance squats. The SABO Deadlift Shoes have a wider than average toe box. I believe it’s this way on purpose because your feet, especially in the forefoot region, will actually expand slightly under heavy loads. When you’re deadlifting or squatting heavy weights your foot will fill out this area better. If you have narrower feet, don’t worry about the toe box being too wide. Your feet won’t be loose inside the front of the shoe IF you make sure to tighten the laces sufficiently. 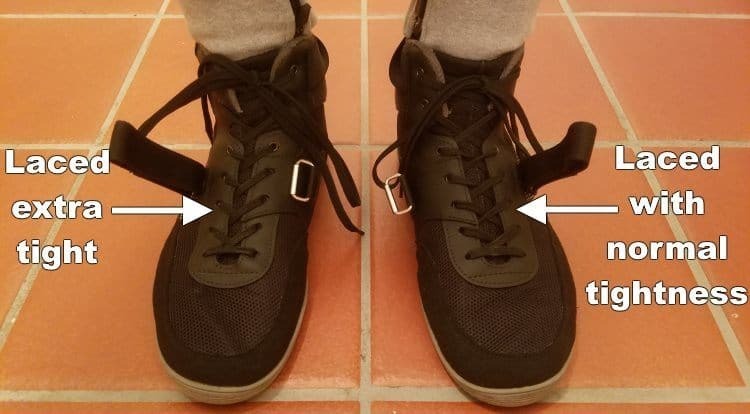 Please note though, that you have to make sure to pull the laces tight starting at the bottom and working your way -- you won’t get as snug of a fit in the forefoot if you just pull hard at the top of the laces. I have an average width foot. When doing conventional deadlifts, I’m fine with tightening the laces maybe a little bit tighter than I do for my everyday shoes; if I need more tightness in the midfoot, I just crank down the metatarsal strap extra hard. However, on sumo deadlifts I found that my feet felt noticeably more locked-in inside of the shoes if I laced them up tighter throughout the entire laces region. IMPORTANT: This means deliberately pulling each row of laces tighter, starting from the bottom and working up to the top. I stress this lacing technique because it wasn’t obvious to me for a while. It only really occurred to me to try to tighten them more once I got better at sumo pulling technique and could use heavier weight. Again, I only ever did conventional deadlifts before getting these shoes. ...Speaking of wide feet, if you have them, then the large toe box is great for you since you’ll be able to slip your feet right in without issue. Also, you shouldn’t have to pull the laces nearly as tight as someone with narrow feet, in order to get a nice snug fit around your forefoot. 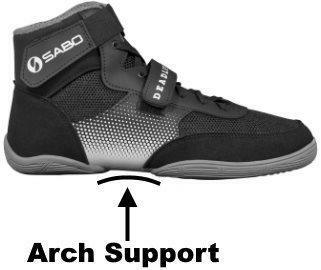 The SABO Deadlift Shoes have some arch support. Not a lot, but some. If you have somewhat flat feet, this is great. If you don’t have flat feet, then it doesn’t really matter, but it’s still nice to have. The fact that these shoes have any arch support to begin with is impressive considering how thin the sole is. Substantial arch support would require a thicker sole to give the extra space to fit a larger arch and the extra material to make it stronger. 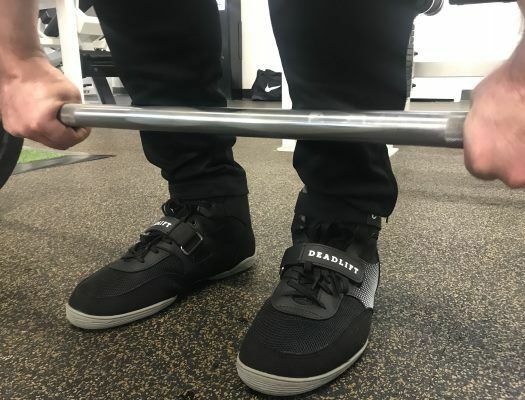 Of course, that would make the shoes much higher than 5 mm off the floor, which is one of the most important features of these deadlifting shoes. The slightly raised and narrow portion in the middle of the outsole: This forms the base of the shoe’s arch. The dramatically curved shape of the center portion of the inside of the upper: First it should be noted that this portion of the upper’s fabric is reinforced and much stronger/more rigid than the surrounding portions. From about 2 inches above the sole, this portion is a similar width as most of the rest of the shoe. However, from there, it quickly tapers down then in, until it meets the narrow middle portion of the outsole. It essentially wraps underneath the rest of the shoe, creating a faux arch shape out of this curved reinforced fabric. The metatarsal strap: The buckle side of the metatarsal strap system is on the inside of the shoe. It’s right there, smack dab in the middle of the curved reinforced fabric portion. When you have the strap secured tightly, it is pulling strongly up on this curved portion. The upward force helps hold the fabric’s curved shape against the force of your foot, thus supporting your arch. The vast majority of lifters would be fine even if these shoes had no arch support at all. The limited arch support they do have makes the shoes work better and feel more comfortable for an even greater number of lifters, including those with mildly to moderately flat feet or related arch issues. If you’re one of the very few out there who really needs orthotics for arch support, I assume you could just put in your custom inserts. Being concious of your foot/arch position and fixing it when you notice it’s wrong is a good start. 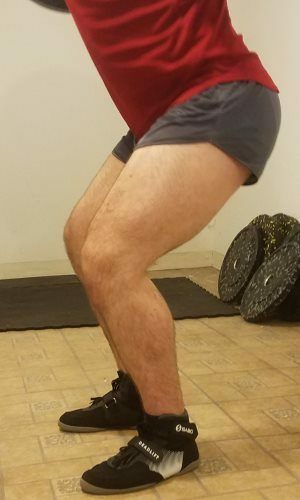 You’ll build up the ability to arch your feet properly when thinking about it, and it will eventually become a habit if you stick with it over time. Add in consistent foot training exercises, plus some unilateral leg work (e.g. single leg RDLs), and you’ll be well on your way to improving your flat foot woes. The shoes are very lightweight. You’ll feel a noticeable difference if you’re used to wearing regular sneakers. They’re able to be so lightweight in large part because the soles are so thin, as I already discussed. Soles on most shoes are the densest and heaviest part of the shoe. When you have the SABOs with 2-3x or more less sole material than your average sneaker, it’s going to feel super lightweight. On top of that, the “upper” is also very lightweight. This is because it’s not a bulky design. No extra padding or thick fabrics. The idea is for it to be firm yet flexible to allow for needed ankle mobility. Additionally, a good portion of the upper is made from a mesh-like material. Not only is the mesh lighweight, but it’s also very breathable; breathability being its primary reason for inclusion in the design. Okay, so it’s lightweight. That’s great. But does it help you deadlift more? Well, not really. After all, you’re not lifting your feet up when you’re deadlifting. However, the lightweight factor is beneficial for any other lift that does involve taking a step. Plus, it just feels great! Even if you’re just walking around the gym, you feel faster and more athletic. 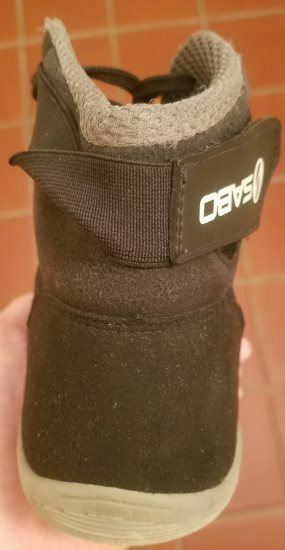 It’s like you’re wearing shoes (foot and ankle support, foot protection) and not wearing shoes (lightweight, low to the floor) at the same time. It’s a great shoe for general strength training, too. The only thing it may not be ideal for is squats. But that’s only if you prefer raised heel shoes (e.g. Olympic lifting shoes like the Reebok Legacy Lifters or cross training/general strength training shoes like the Adidas Powerlifts). There’s plenty of lifters who prefer to squat in flat soled shoes. Usually, that’s low bar squatters. Whereas, high bar squatters typically prefer the raised heel shoes. If you’re in between, you may prefer either. If you really want to be as low to the floor as humanly possible in these shoes, then you’ll be happy to know that you can remove the insole. The insole is thin to begin with and it’s really just there to provide a bit of padding for comfort. It adds maybe ½” mm of height after being compressed by your body weight. I personally don’t think it’s worth taking out, but if you’re competing and looking for any edge possible then maybe you’ll think differently. There may be loose threading at the edges of the strap. As you can see from the image below, there are loose threads randomly along the edge of the strap. These frayed edges may have been there when I got them -- I’m not sure. I just know that I noticed it in the first couple weeks of training, and they never got any worse even after several months. It hasn’t affected the strap’s functionality at all, so I consider this an predominately aesthetic flaw. I actually think it may just be extra thread leftover from a sloppy but functionally adequate sewing job in the factory. 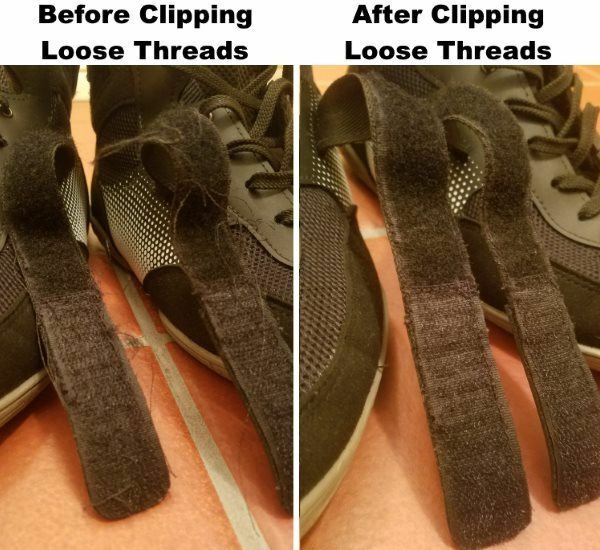 If this happens to your pair, you can simply snip the loose threads with scissors. That’s what I did after having the threads hanging out there until just recently. I haven’t noticed any more threads coming undone since. The collar has slight scratchy or abrasive feeling against your skin if you wear low socks. This isn’t painful at all, but it is annoying. I thought it might go away after being broken in, but I still feel it after almost 4 months of use. The reason for the Luckily for me, and by extension you, I came up with a brilliant solution to this problem…Wait for it…...Don’t wear “no show” socks! 🙂 Ankle socks are fine. And obviously, any thing longer than that works, too. The shoes come laced in a somewhat non-conventional way. This style of lacing makes it take longer to loosen or tighten the laces when taking the shoes off or putting them on. 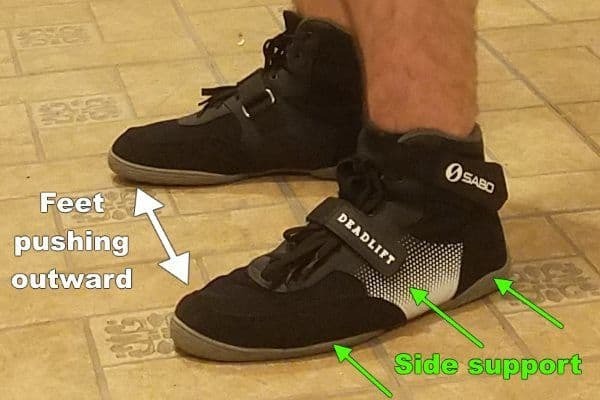 NOTE: Before getting into the sizing details, I want to point out an important change between this current version of the SABO Deadlift Shoes (i.e. the “2017” version, which is still the current version as of October 2018) vs. the previous version: For a given size, the current version is meant to fit snugger than the previous version. So, if you’re in between sizes, you should go with the larger size. 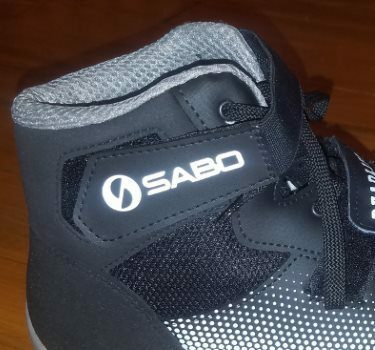 If you watched or read other SABO Deadlift Shoes reviews elsewhere online and they recommended going with the smaller size if you’re between sizes, you can assume they’re talking about the older version of the SABOs. Use the US Men’s to RUS shoe size conversion chart. This one applies to most of my audience, which US-based males. If that’s not you, see the second method below. Assuming you’re a US male, then using this conversion chart is a good way to get a ballpark estimate of your correct size. However, it may not be totally accurate since US sizes vary between different types of shoes and shoe companies. Be sure to use the second method as well. Measure your feet and convert the length to the corresponding RUS size. This is by far the most accurate method. I recommend comparing the RUS size you come up with based on your measurement, against the US men’s to RUS conversion chart below -- if it’s wildly different than your normal US men’s shoe size, chances are you messed up on the measurement. Below is the Russian to US men’s shoe size conversion chart. If you’re a woman, or if you’re a guy who’s used to non-US shoe sizing system, just skip this chart and jump straight to the measurement method section. The best way to ensure you get the perfect size is to measure your feet and then convert that into your correct size. Below are the step-by-step on how to do that. The basic steps are from SABO. However, I added in a couple of my own recommendations as sub-steps, because I kept getting different measurements using their default steps when I was buying my pair -- I found that these modified steps made it much easier to get an accurate measurement. Get a sheet of paper, a pen and ruler (with millimeters). Using the ruler as a guide, draw a straight line down the middle of the paper, lengthwise. Make sure the line is longer than your foot. Place the paper on a floor, so the side with the line is facing up. I personally recommend putting one edge of the paper against the wall (I’ll explain why in the next step). Position your foot on the paper such that your heel and longest toe are centered on the line. It’s important that you’re standing since your foot will spread out more when bearing your full weight, leading to a more precise measurement. If you have the paper at the edge of a wall as I previously recommended, be sure to stand on the paper with your heel against the back of the wall as well. This ensures the starting point of your measurement is correct (i.e. back of heel/the edge of the paper). If you try to stand on the paper without a wall to ensure alignment, you could potentially be off by a full size in either direction -- I remember trying it that way and getting different sizes each time I measured. Draw a mark on the paper at the tip of your toe and the back of your heel. Do the same with your other foot. For each foot, Measure the length (in millimeters) between the two points. Use the length measurement of the longest foot. Add 5 millimeters to that measurement. Find your corresponding size in the table below next to your total measurement in millimeters. If between sizes, go with the larger size. Overall, I give the SABO Deadlift Shoes a 5 out of 5 rating. They have some minor flaws that I discussed earlier, but they’re too inconsequential to affect my 5 star rating. I absolutely love these shoes. They completely blow alternative deadlift shoes like the Converse Chuck Taylors, Vans, wrestling shoes and others, out of the water when it comes to performance. The are an excellent choice for anyone serious about deadlifting. This includes conventional deadlifts, and goes doubly if you do sumo deadlifts because of the increased need for ankle and side support. If you do squats with a wider stance, that’s one more big reason to get these shoes. You also have to be willing to drop about $90 on them. However, that’s well worth the price if you’re serious about maximizing your strength and technical efficiency on deadlifts. Plus, they’ll last a long time, so this cost gets spread out -- I’ve had mine for 6 months, and could see them lasting at least another years under the same conditions. 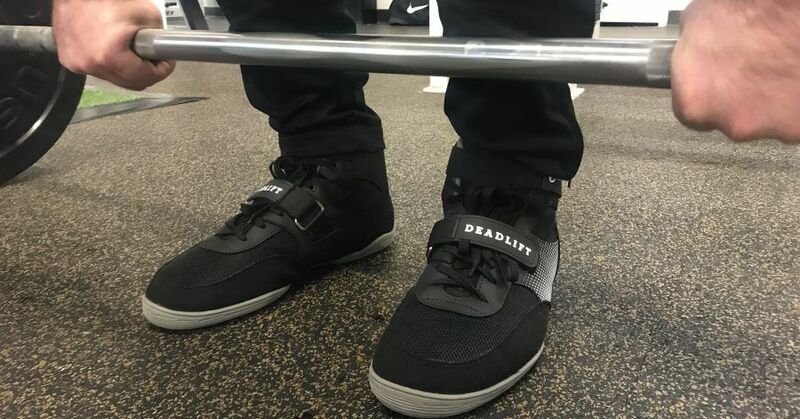 If you don’t need raised-heel Olympic lifting shoes for squats, then you could use the SABO Deadlift Shoes as your only pair of lifting shoes. That means saving money and saving room in your gym bag. 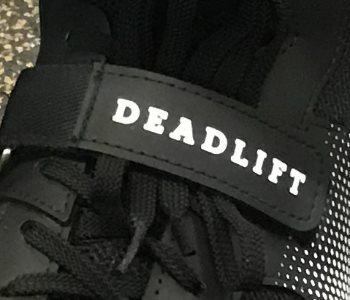 If these shoes sound like a good choice for your training needs, then you can buy the SABO Deadlift Shoes on MaxBarbell.com (the only US distributor). Thanks, they’re great shoes. I still wear them for 2/3 of my workouts. I’m sure you’ll love them too if you end up getting a pair. Thanks for the review man, it was really detailed. I’m someone who has flat feet and I’ve been trying to find a lifting shoe that works, this might be my answer. Thanks, G. I hope they do the trick for you.